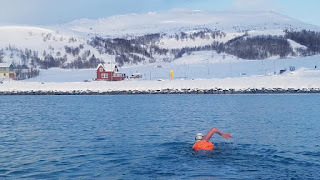 Courtesy of Ger Kennedy, Mikkelvik Brygge (located at 70° 3' 12.312'' N 19° 1' 55.2396'' E) at the Norway Ice Swimming Expedition in northern Norway. Ger Kennedy led the way on Super Ice Saturday at the 2017 Norway Ice Swimming Expedition in northern Norway in Mikkelvik Brygge. But the Polar Ice Swim was too short so he will have to re-swim on Monday. 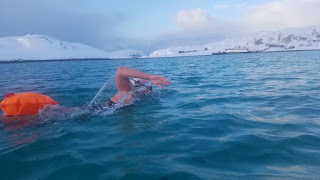 "But Jamie Monahan and Kate Steels-Fryatt completed their Polar Ice Miles, subject to ratification from the International Ice Swimming Association. Jaimie and Kate are the new polar ice queens at 70° North while Pakie Bolster swam Polar Ice Kilometer in 2.5°C water and -5°C air. The water visibility is incredible with sea life like sea urchins and starfish."